Villa UJV 336, also known as Villa Ushuaia, is a 4 bedroom, 4 bathroom villa located in Flamands close to La Petite Anse bay. This spacious and very private villa is perched on the hillside and overlooks the ocean and the cliffs of Colombier. 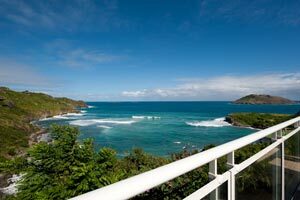 Two of the nicest beaches of St Barts, Flamands and Colombier, are nearby. Flamands beach is within walking distance or short drive, or you can hike to Colombier beach by taking a little path from the villa. The four air-conditioned bedrooms each features cean views. Bedrooms one through three each have queen beds with tub, and the fourth bedroom has two twin beds and a shower.